In German it's the longest letter... We pronounce it "ypsilon"
Or we could just use Achim avatar for the next marathon! 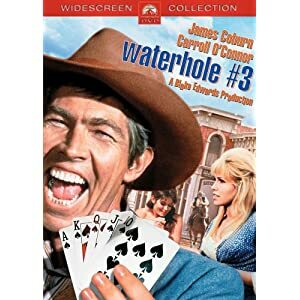 This is a satirical western involving stolen army gold and the various people who are after it including conman Coburn, sheriff O'Connor (and his daughter), army deserter Akins and others. And just when you think you know who's going to wind up with it, there's another twist in the storyline. At the very end, we still aren't shown who winds up with the loot as one last chase has begun and "The End" shows up on the screen...you get to make your own decision who winds up with the gold. Throughout the movie, there is a song that goes on, a ballad sung by Roger Miller. I enjoyed that, but I've always liked his music...someone who isn't crazy about that kind of music might not be as appreciative as I. Overall, I enjoyed the film...it's not quite your normal western. That makes 12 watched! I'm ahead of schedule! Show off. I'm still trying to juggle titles to fill my list. It is remarkable how Kaufman could succeed so greatly in making an erotically charged movie with "The Unbearable Lightness of Being" and then come up with such utter trite only two years later. While I have done it before... I find it to be a bit difficult. Usually I need at least 2 days for a TV Series. Unless it is a short season. I am just happy to say it is over! Getting a late start... but I'm in! I've got a few more done...up to 13 done. Working on a review of one now..will try to post about 2 of them here later tonight.